The color of the month is RED Hot! What a summer here at artgoodies. SO busy! And there have been so many red hot sales happenin! Just this last week another event with Joss & Main, the One Kings Lane event and launch is happening NOW, and see the previous post for the deal you can get with Abe’s Market! So naturally, I thought Red would make a great color of the month! Fave pieces, my grandma's tea canister of course. 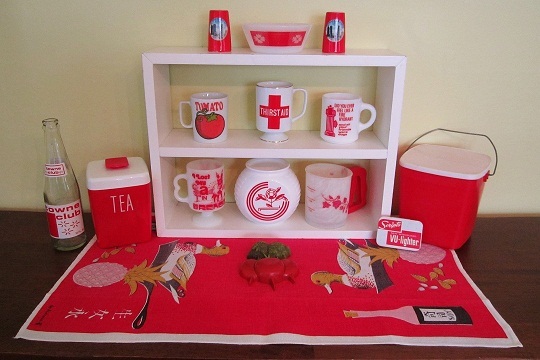 And really all of the super kitschy mugs! Annchored by a vintage tea towel, also check out those Chicago salt and p's! I love this bold and fantastic vintage tablecloth. A great way to make a statement with color! 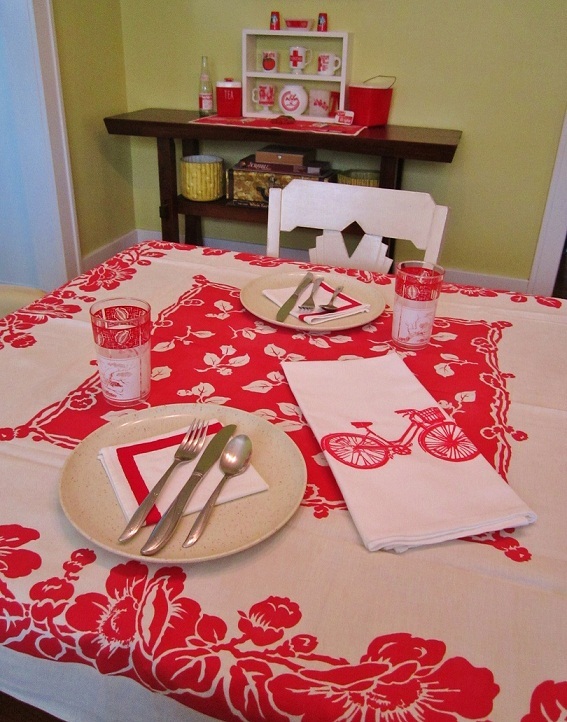 Check out the vintage red lantern glasses, speckled melmac plates, and red stripe napkins with my usual vintage twin star silverware. Plus the look isn't complete without an artgoodies bike towel! 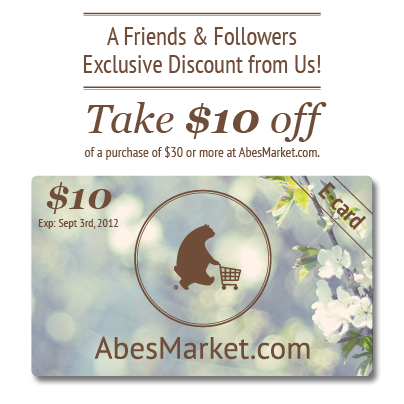 Special Promo on Abe’s Market! THANKS TO EVERYONE WHO CAME OUT TO THE SALE! It’s time for a Mega Sale! I need to clear out some 2nds and inventory to make room in the studio. Discounts of 50% off or more! Come early for the best selection and tour the garden! Plus, I’ll probably throw in a few select vintage items as well! I just received a copy of Indianapolis Monthly in the mail today. 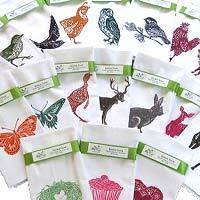 Luckily, Amanda from Homespun in Indy, who carries artgoodies products let me know about this! 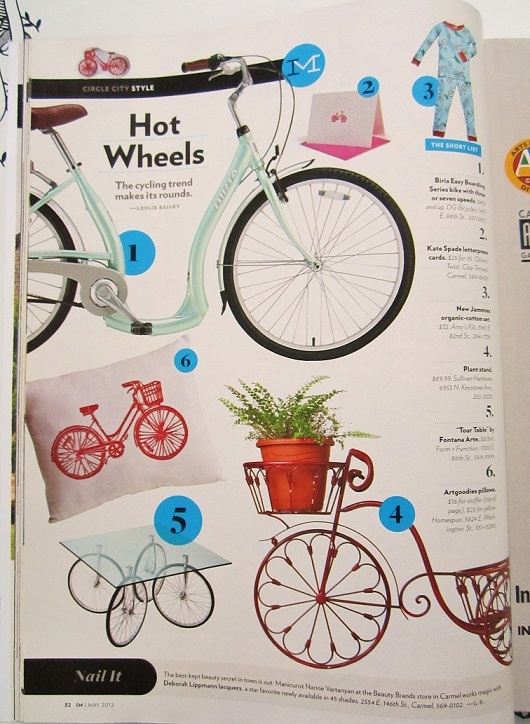 This May they featured my bike squillow pillow and my stuffie mini pillow- hiding up top. I'm excited for the feature of course! I have to say though, it is pretty odd that they turned the image on my bike stuffie around. Nope, sorry folks, bikes only ride to the right here at artgoodies!